When most brands update or come out with a new version of a popular series, they just tweak them a little, perhaps adding a few features or small cosmetic adjustments here and there, but basically it is still recognizable as being the same binocular. However from my first impressions, the NEW Eagle Optics Ranger ED binoculars seem to be completely dissimilar to the previous models. Not only do they have a completely new look, but they are made using alternative materials and are also set at a new, cheaper price bracket. 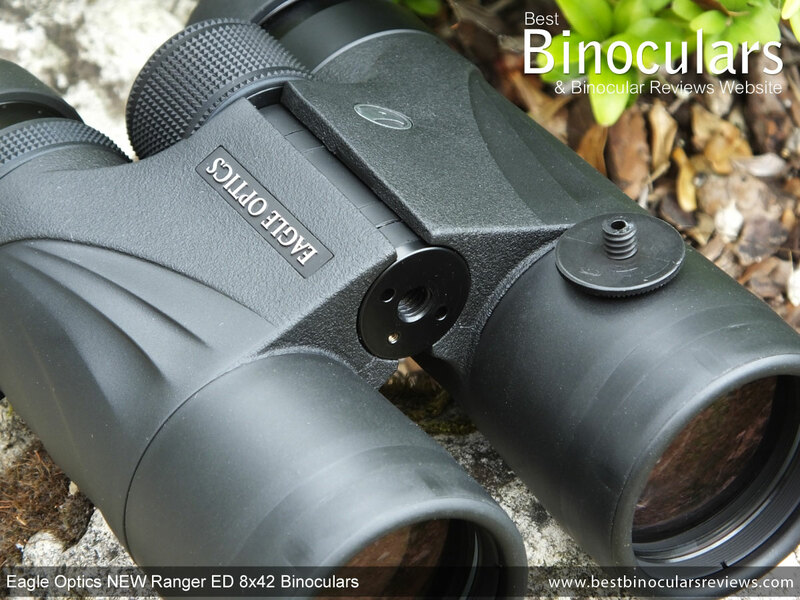 I really liked the previous models, which you see if you read my review of the "old" Eagle Optics 8x42 Ranger ED and indeed they eventually went on to win my award as the Best Birding Binocular of 2011. So when this NEW Eagle Optics 8x42 Ranger ED arrived on my desk, I was really intrigued to take a closer look and see exactly what changes have been made and just how this affects the overall handling and the image produced. As you can see from the image on the right of the older version of the Ranger ED, the most obvious change to the newer model is that Eagle Optics have now decided to revert back to a more traditional roof prism body shape, with a larger single bridge rather than staying with the two thin bridges on the open body design. The older open bodied Ranger did give you more of the barrels to hold onto for a better grip, but the big gap in the center meant that they were also quite a long binocular (6.7in / 17cm). Whereas the newer version is far more compact, indeed it is almost an inch shorter at only 5.8in / 14.7cm long. Whilst the new Ranger may be more traditional, Eagle Optics have positioned the bridge on these a little closer to the eye-pieces rather than being in the center of the barrels. This is quite similar to what is referred to as the "Top Hinge" design found on the newer Zeiss models and indeed that of the Hawke Sapphire ED 8x42 bins and leaves a little more of the front part of the barrels exposed which is great for holding onto, especially when you are not actually glassing, but carrying them with just one of your hands. 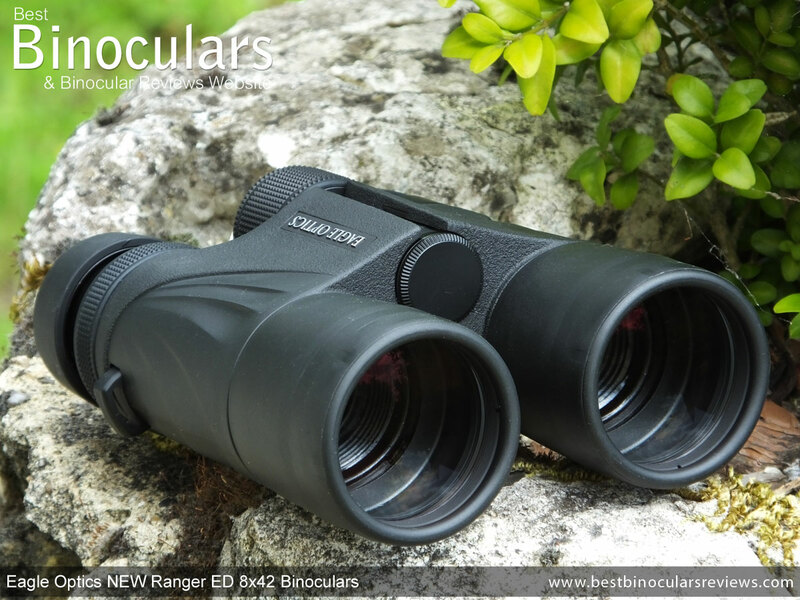 Rather than the higher specification magnesium that was used on the older Ranger ED, Eagle Optics have decided to go with the more cost effective polycarbonate frame for these new versions. So whilst it may not have quite the same luxurious feeling or in theory be quite as strong as the older ones, it should still be strong enough for most normal uses. Polycarbonate frames like these do however have the advantage of being cheaper to make which I am sure is one reason why this version has a lower recommended price. It is also does not corrode and is lighter, which as you will see below, I am sure contributes to the large weight difference between the two. 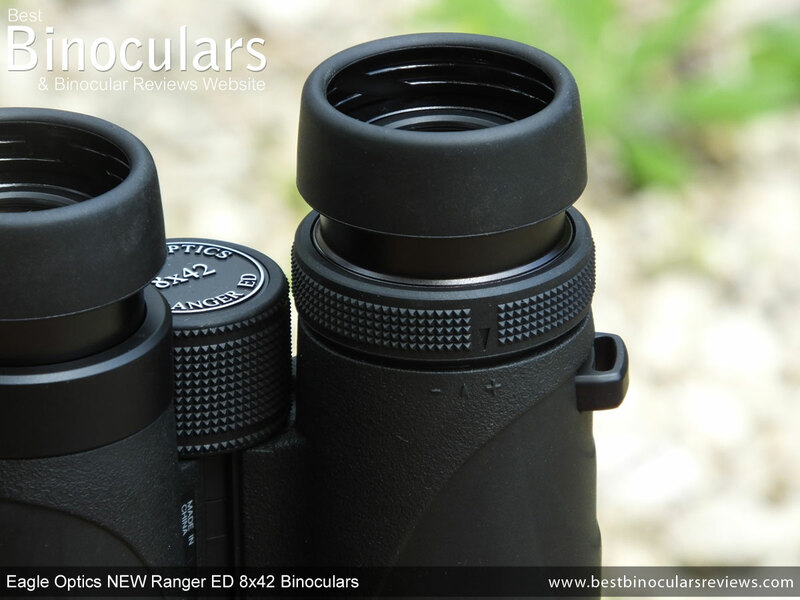 Unlike the older Ranger ED, where the metal bridges and some of the inner parts of the barrels were left exposed, almost all of the external surface on the new Eagle Optics Ranger ED binoculars has a rubber covering. Whilst these different textured sections on the older model looked great, the "full rubber jacket" on the newer model ensures that all of the device is less reflective and cushions sounds a little more and thus for people like hunters and birders who need to remain hidden and as stealthy as possible, this is an important change. The rubber used to cover the chassis is quite hard and not as textured as I see on some and thus does not improve the grip levels that much more than had it been left exposed. On top of this the rubber is quite thin and whilst it does add a layer of protection, it is perhaps not quite as protective as those with much thicker and spongier coverings. On the flip side, it does look really tough and so shouldn't perish and I doubt will be easily worn away over time. The underside of the body lacks any thumb indents that are quite common and whilst there are a number of recessed details moulded into the armour, they are more for the instruments looks rather than for any function. On the side of each barrel is loop, which are used for attaching the binocular to the neck strap. Rather than being fixed or glued to the chassis, they seem to be part of the mould and so wont work loose and look to be more than tough enough for the job required of them. The 42mm diameter objective lenses are set back about 10mm from the ends of the barrels. For a bin of this size, this is good and as with photography, the overhanging barrels effectively create a small hood for each lens and thus helps to prevent something known as lens flair occurring in some lighting conditions. This also means they lenses are better protected from both physical damage and from falling dust or light rain. 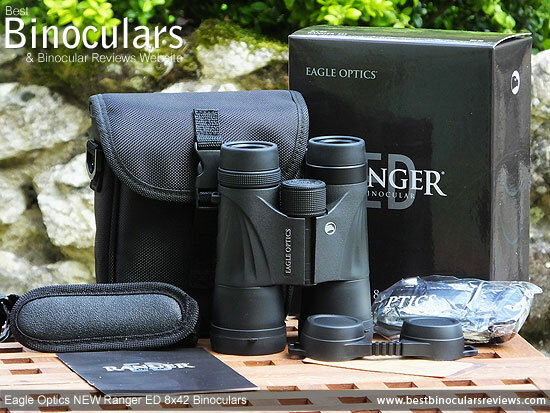 These Eagle Optics NEW Ranger ED 8x42 binoculars are completely sealed with O-rings which prevents any moisture or fine dust from getting inside and whilst they are described as being waterproof, there is no stated recognized standard or depth. These bins are also described as being "fogproof" - what this means is all the barrels are filled with nitrogen gas, which unlike normal air, is completely moistureless and so stops any internal fogging of the lenses and other glass surfaces. More advantages of this airless and moistureless environment is that it inhibits most types of corrosion and stops mould from growing which you often see on the inside lens surfaces of vintage binoculars. To fix these Eagle Optics Ranger ED binoculars to a tripod is really easy. All you have to do is unscrew the dust cap located on the front face of the bridge and then screw in a standard and easily obtainable tripod adapter, which then fixes onto your tripod/tripod head. As with almost all bins, you simply open and close the central hinge, which moves the eyepieces closer or further apart, to ensure that the ocular lenses perfectly match the distance between your eyes. 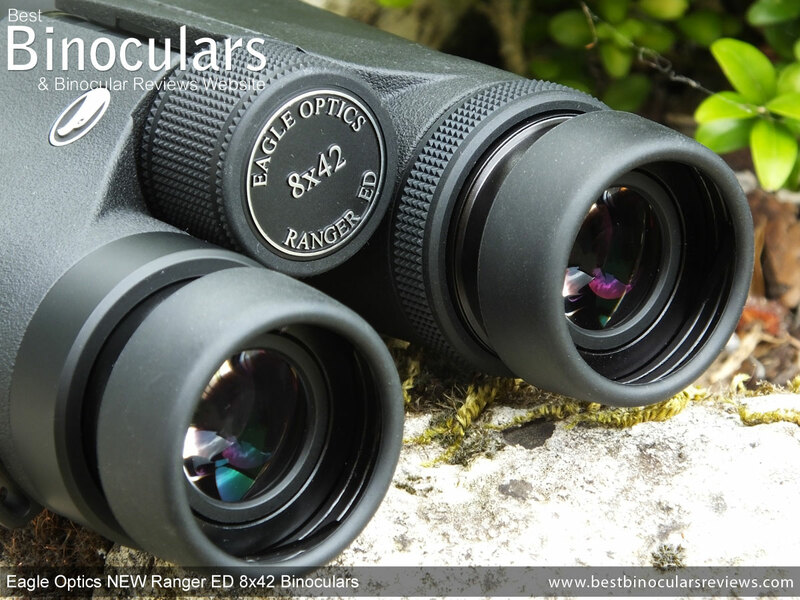 These new Eagle Optics Ranger ED 8x42 binoculars have a maximum IPD of 7.5cm and a minimum of 5.5cm, which for a full sized bin is a very good range and matches the best on both extremes. Whilst it may not be quite as luxurious as the metal ones you get on some very expensive binoculars, I don't think it looks at all cheap, it does feel robust and I could not get any unwanted play or movement out of it even after a really vigorous inspection. The turning of the wheel is nice and smooth, with the right amount of resistance to prevent undesired or over tuning of the wheel easy, but still make adjusting the wheel, even with one finger simple. The wheel has a diameter of 3cm which is good for a full sized bin, but perhaps a millimeter or two smaller than what I would call large and so does not project as far up above the top of the central bridge as some. This does make for a nice low profile look and whilst for the most part this may not seem important, in situations like where you have thick gloves on, it can make a small difference to how easy it is to access. However Eagle Optics easily make up for this with a really deeply textured, soft rubber track that runs around the wheel that gives it loads of grip and I was able to easily and accurately adjust the wheel when testing with gloves on. Taking just over 1½ rotations (approx 540°), the gearing on these is slightly different to the open bridge Ranger ED and it now takes a little less turning to take the focus from infinity to it's minimum. This is what I would call a fairly neutral setup and thus delivers a good compromise between the speed at which you can make large distance focus adjustments and making it easy to make fine adjustments. Adjusting the diopter that is used to calibrate the binoculars so that they make up for any difference in vision between your eyes is postponed in the usual place, with a ring that goes around the barrel just under the right eyepiece. 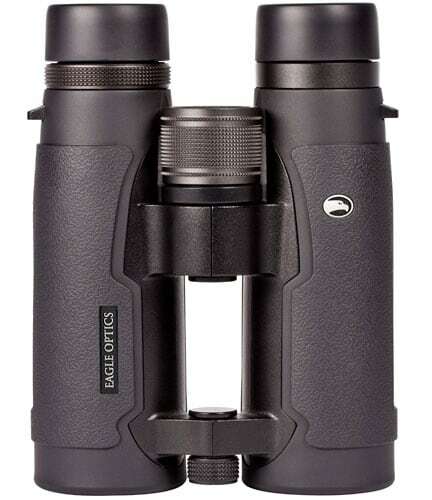 The one on these Eagle Optics binoculars is excellent as it turns both easily and smoothly and just like the focus wheel, it has a soft highly textured rubber track that delivers more traction than you will ever need when making adjustments. But the best feature is that it is also lockable, meaning that you first have to click it upwards to move it and so as long as you remember to lock it after you have it in the correct position, you should never loose your setting by accident. What it is missing in my opinion and is something that most manufacturers do forget is to add more markings or better still would a scale. Whilst there is an arrow to indicate the "zero" setting and a + and - sign, just either side of it, if your personal setting happens to be somewhere else other than on these markings, you will either have to re-calibrate your bins every time you change the setting (like if you share your binoculars with somebody else with different vision), or make your own marking. To be fair this is only a very small grumble as you could easily make a mark using a small permanent marker or possibly with a small nick using a sharp knife, but I just feel it would just be better if you did not have to it. The eyecups are excellent: The actual eyepiece housing looks to me to be made from metal and the helical twist in and out eyecups not only have very smooth action, but they feel really robust, which is important as this is the most commonly damaged part on a binocular. Furthermore, the cups click securely and rather satisfyingly into each of the four fixed stops, meaning you get four fixed positions that you can set the eyecups at: fully extended (which is what most people who don't wear glasses will use), fully extracted (which is what most people who wear glasses whilst binning will use) and for added flexibility, you get two intermediary positions. This along with a sensational 19.5mm of eye-relief should ensure that just about everyone is able to find their own correct distance for their eyes (with glasses on or not) behind the ocular lenses to get the complete view, lacking any dark rings around the edges when looking though these bins. Each eyecup has a 39mm external diameter, which is possibly a millimeter or two less than many full sized bins out there, but I found them no less comfortable than the majority because of it. Even though they had a weight saving open bridge body, the previous incarnation of this Ranger ED was quite a lot heavier than the new ones. I think the main reason for this was that they also had a heavier magnesium frame, whilst on these new ones they have reverted to a polycarbonate one. As you can see from the table of similar bins below, the NEW Eagle Optics 8x42 Ranger ED compares very well with some of the lightest binoculars I have tested. However what I think is important to mention is that whilst the do feel light in the hands, they don't feel cheap, plasticky or frail in any way, which can sometimes be the case with cheaper less well made lightweight optics. Indeed I would almost go as far as to say that the opposite is true and before reading their specifications, I actually assumed that these were made from magnesium. 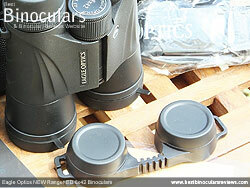 Eagle Optics 8x42 Ranger ED 27.4oz (777g) Open Bridge Magnesium 6.7in (17cm) 5.0in (12.7cm) ? 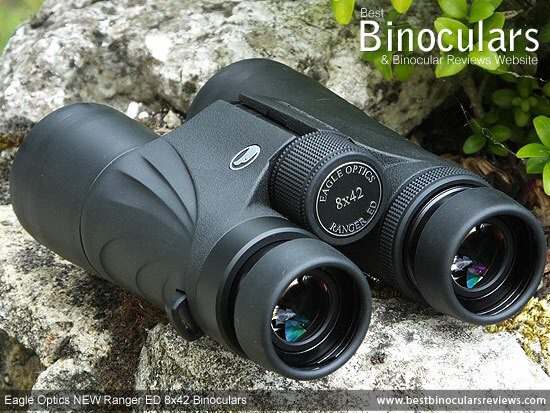 Once again if you compare the dimensions of these versus the older Ranger ED, you will notice that Eagle Optics have made the binocular a whole lot shorter and they now compare far more favorable with other similar instruments in this size class. Their "official" length of 5.8in /14.7cm is like almost all others taken with the eyecups twisted in and the objective and ocular lens covers removed. By twisting out the eyecups, I measured the length to 6.1in /15.5cm and then by adding the lens covers their absolute maximum length becomes 6.6in /16.7cm. In the same way, their width of 5.1in /13cm is taken with the central hinge fully opened and their lens covers removed. In this state, I also measured their minimum height (or depth) to be 2.2in /5.6cm. However if you add the rain guard (ocular lens cover), the two loops on the side of the cover increase the width quite a bit more to become 5.5in /14cm. Closing the central hinge (setting the IPD to the minimum), reduces their width to 4.4in / 11.3cm (without the rainguard) and at the same time increases the height to 2.9in/7.5cm. Other than to say that they are multi-coated with an anti-reflection material (see coatings below) and that they have a diameter of 22mm which is quite common for a full sized bin, but perhaps a couple of millimeters less than those with the largest, unfortunately I cannot elaborate as Eagle Optics do not supply any info on the makeup of the ocular lenses and the eyepiece. At 42mm in diameter, the objective lenses are the most commonly used size for a full sized binocular and they strike a good balance between their size (and weight), cost to manufacture and their ability to gather light. Like most modern higher end optics, rather than being fashioned from a single piece of glass, the lenses are actually made up of multiple lens elements all from different types of glass that have different properties. Each of these is carefully selected and put together in such a way as to better direct the captured light in the desired and best possible way. 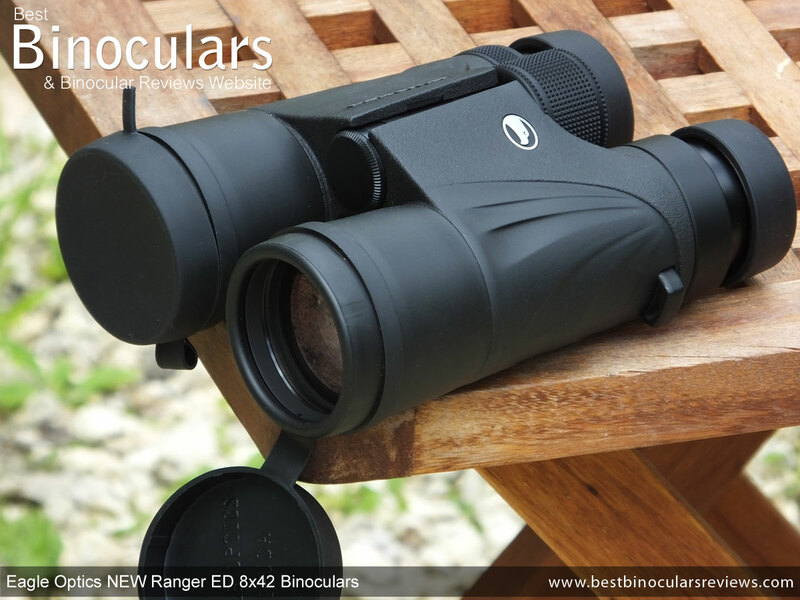 As is advertised in their name, one of the lens elements in these Eagle Optics Ranger ED Binoculars consists of a special type of glass that has extra-low dispersion properties. When you combine an 8x magnification on a bin with 42mm objectives, you get an exit-pupil that is 5.25mm wide (42 � 8 = 5.25). What this essential means that these binoculars will provide your eyes with more than enough light for you to precise a nice bright image in all but the very worst light conditions and thus are ideal in almost all conditions. This is also one of the main reasons why the 8x42 configuration is the most commonly found and used as you get a great balance between light gathering ability, low light image brightness, size, weight and image detail. Just like the older version these and all the Eagle Optics Ranger ED binoculars in the series use roof prisms fabricated from BaK-4 glass. Whilst they do not offer any further details, I will assume (because the bins are made in China) that this glass, like most produced these days is the Chinese version of BAK4 made from a phosphate crown and not the Barium Crown ones made by Schott. Whilst the Chinese BaK-4 is generally considered to be of a slightly lesser quality with slightly different refractive and dispersive properties, they are much cheaper and for the most part still preferred over the even cheaper BK-7 glass for use in a binocular. 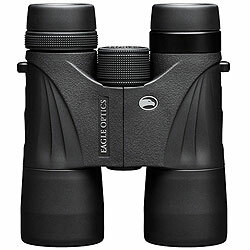 Being "Fully Multi-Coated", these Eagle Optics binoculars have multiple coatings of a special anti-reflective material added to every lens surface throughout the optical system and thus will transmit more light to your eyes than those that only have single coatings (Coated) and even those that have multiple coatings, but only on some glass surfaces (Multi-Coated). The result is a view that is observably of a better quality as well as brighter image in poor lighting conditions. Whilst the roof prism design has a number of advantages over the more traditional porro prism especially in terms of it's shape which enable manufacturers make a more compact straight though design of binocular, you pay for this in that, to equal the optical performance of a comparative porro, you have to add a number of coatings. Firstly to ensure the highest transmission levels possible of the light through the prism, they have used dielectric coatings. The reflectivity of this is more than 99% easily outperforms cheaper mirror coatings like silver (approx 95-98%) and aluminium (87-93%). Whilst the numbers may not seem to be too different, the fact that they use dielectric coatings is quite a big deal especially within this fairly low price bracket as adding them is a very specialized and expensive process and I usually only see these coatings being used on far more expensive "alpha" type binoculars. Secondly, as the light passes through a roof prism, some of the wavelengths move out of phase with each other. Many cheaper bins leave this unchecked which saves costs, but results in a lesser contrasting and lower resolution view. The prism surface that causes this phase shift on these Eagle Optics binoculars however has had a special phase correcting material added to it which eliminates this issue. Once again this is great news and something that is not always found on bins in this price range. 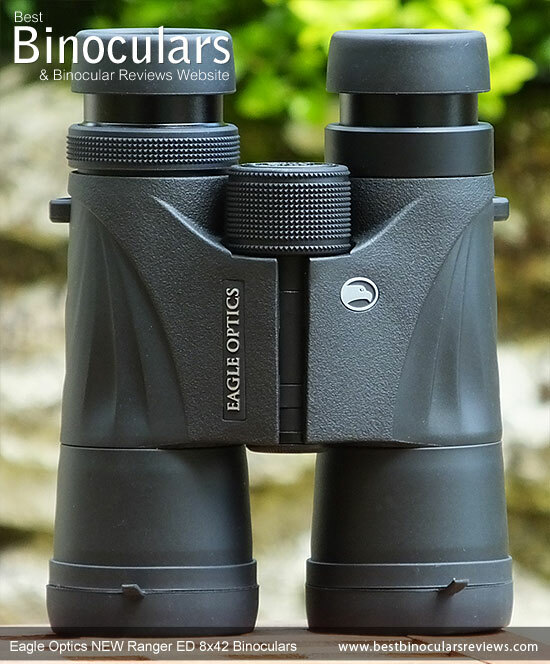 As you can see, these Eagle Optics Ranger ED II binoculars are up there with some of the cheapest binoculars to have Fully Multi-Coated optics, ED glass lenses and both Dielectric and Phase corrected prisms which is excellent. Indeed in terms of coatings all these really lack when compared to the VERY best and most expensive alpha bins are the scratch and water resistant coatings on the exterior lens surfaces. Looking through the binocular, the image that you see is 341ft wide at 1000 yards away (114m wide @ 1000 meters) away. Or to put it another way, they produce a angle of view from the binocular of 6.5°. 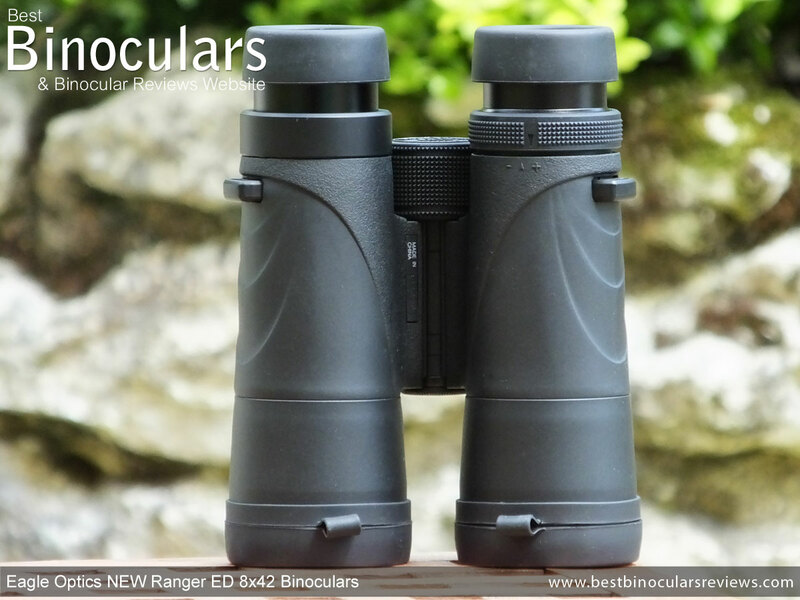 As is demonstrated in the comparison table below, whilst this FOV is in no ways bad, it is narrower than some of the best 8x42 binoculars, which also include the older version of the Ranger ED and was one of the factors that helped it win the best all round Birding Binocular in 2011. Optics is all about compromises, so the slightly narrower FOV, helps these binocular produce their very long 19.5mm of eye-relief, which easily ranks along with the best long eye-relief binoculars that I have tested. As I have already discussed when going over the exterior of the binocular, this long eye-relief along with the very good eye-cups with their two intermediate click stops make them an excellent option for those who use bins with their glasses on. Another really strong area on these is their very close minimum focusing distance of only 5.2ft (1.58m). For a standard full sized binocular, I class anything at 6ft or under as excellent and so these are outstanding in this area and whilst they may not match a few specifically designed close focus bins, like the popular Pentax Papilio 8.5x21 binoculars that have specially designed converging lenses, these really do make an excellent choice for those who want to get a very detailed view of closer ranged objects like birds, butterflies, as well as other insects and flowers for example. However what is even more impressive is whilst their official close focus is 5.2ft, I measured the closest distance that I could focus with my test pair as being an even closer 4.9ft (1.48m). Whilst you do get a little image crossover at this extremely close range, you also really can get a wonderful and detailed view on close range objects. In good light all three binoculars looked to me to be equally bright, which seeing that the 5.25mm exit pupil produced by the 8x42 configuration on all of them was supplying my eyes with more than enough light is not at all surprising as it would take a particularly bad binocular to notice an obvious difference in these conditions. In bad light is where you can sometimes see a difference in image brightness between the good and the very good and here I would easily rate these along with the very, very, good. I did feel these were brighter than my mid range benchmarks and could really not see any difference when I compared them over and over again, against my very high end alpha 8x42 bins. Superb. The colors look natural, but I did feel that in especially bright light, they were perhaps a tiny fraction less vivid than that on my high end benchmarks. I have to add that the difference was minuscule, even to the point that I started to doubt myself after going back and forth many times but had to mention it just in case! I thought that the contrast between light and dark was good and I saw no noticeable difference between these and my very high end benchmarks. Probably the main reason for using extra low dispersion glass within the lenses is to reduce the amount of chromatic aberrations, which in turn should mean that you get an image with less color fringing. I say should as just by using it does not guarantee this will happen: the designer of the optical system still has to do a great job to get everything right and I have actually seen some better quality bins without ED glass outperform some in this area that do use it. Well, to me it looks like the lens designers of these Ranger ED II's have done an excellent job. I really had to look very hard, buy studying the edges of very highly contrasting objects to see the faintest hint of color fringing. So whilst like the very best, it is still there, but it is really almost completely unnoticeable under normal use. The view looks really flat and remains so right to the edges without any noticeable "pin-cushioning" or "barreling" (types of distortions where straight lines seem to curve inwards or outwards slightly). The amount of softening or blurring of the image right at the edge of the view is pretty much nonexistent which is also very impressive. Due to their use of really high end optical components and coatings, I expected these to produce a really high quality as well as bright image and I was not at all disappointed. These are up there and pretty close to as good as it gets within this price and size class. Whilst I could not describe it as being luxurious, the Eagle Optics Ranger ED neck strap is perfectly functional and comfortable. The padded neck and shoulder section is more elasticated and stretchy than most. At 3.7cm across, it is also a little less wide and with about 4mm of padding, it is not as thick as some. But to be honest, with such a lightweight binocular this really does not make a difference and I found the strap to be perfectly comfortable, even after long periods of waking with them around my neck. The stitching looks strong as do the fake leather connectors that fix the padded part to the thinner nylon sections, which you thread through the loops on the binocular and then back on themselves with a slider in the normal way, enabling you to adjust the length of the strap. So as I started by saying, you sometimes see more luxurious straps that may feature engraved logos or real leather sections, but in reality whilst these work just as well, just without the balls and whistles. Like the "old" one, the new Ranger ED has a soft, nylon carry case, which has a reasonable amount of internal padding and so provides a decent amount of protection to the instrument inside, but is obviously less than those few bins out there that come with semi-ridged or hard cases. Eagle Optics have added a belt loop on the rear of the bag, making it easy for those who like to carry their bins on their hip. The included shoulder strap can also be easily removed and replaced as it connects to the bag with a couple of quick release clips. These are also swiveled, making it easy to untwist the strap if needed. The strap itself is fairly simple and apart from a shoulder slider is un-padded. Like the neck strap, you can also alter the length of it to suite your preferences. Access to the interior is via a large fold over flap on the top of the case. This lid is held closed with a quick release clip. I really like this method as it is quicker and more simple to open than a Zip, but is much easier to be quite and make no noise than those that use Zips or Velcro, should the need arise and you have to remain concealed. The clips are also more secure than the magnetized fasteners, but on the downside do not seal the bag as well as Zips do. Inside the case there is a separate mesh pocket, perfect for keeping a few small items like a cleaning cloth, money etc from the bin. The fit of the binoculars within the bag is very snug. Whilst this offers a little more protection as they won't move about, it does make taking them in and out a little more time consuming. Unlike some however, you can still just close the lid with both the objective lens and ocular lens covers on the bin and the eye-cups twisted out, but it is tight. 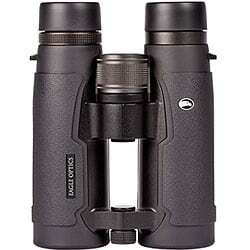 The objective lens covers that are included with these Eagle Optics binoculars look to be made from a soft plastic. The actual covers fits snuggly over the ends of the barrels, meaning they should not easily come away when you don't want them to. The fact that they fit over the barrels is fine and indeed functional, but perhaps not as pretty or as streamlined as those that fit into the barrel ends. Each cup has a small tab on the top and whilst I can't say that these add to the overall looks and streamlining of the device, they do make it a little quicker and easier to remove them. Like on many other modern bins, the lens covers are attached to the binocular by with a separate ring that also goes around the barrel, meaning the cup can simply hang down under the binocular when you are glassing. This works really well and makes sure that they are always at hand and quick to replace and thus protect and help maintain the cleanliness the lenses at all times when not in use. This is all great, but I have to say that the material used to make the ringed connectors is not as strong or as flexible as perhaps it should be, indeed one of these loops broke whilst I was removing them from the binocular and I don't feel I was applying an excessive amount of force. Perhaps I was unlucky and this is a one off fault, but even so it would be nicer if they were beefed up a little. The rubber rain guard or ocular lens cover is fairly standard in that it has a couple of loops for you fix them to the neck strap should you wish and has a flexible rubber connecter between the two cups so that they will fit no matter what your inter-pupillary setting is. Like the objective covers, the fit was good on my test pair and they were easy to put on and they never fell off unwontedly. 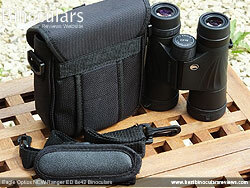 Eagle Optics have included a decent cleaning cloth with the Ranger ED, but I would still recommend that you get yourself a more specialized lens cleaning kit to properly maintain the good as new look through the bins, ensuring your lenses and their coatings don't get damaged whilst cleaning. 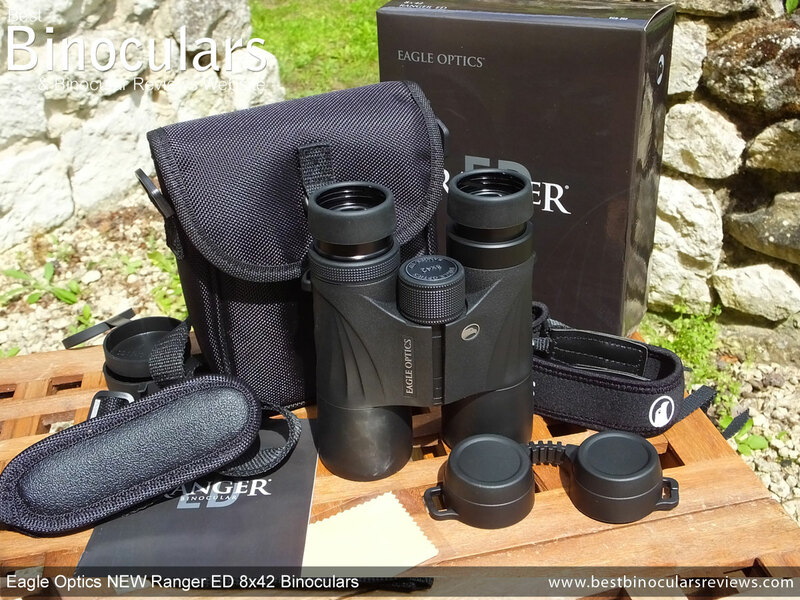 Eagle Optics offer their no charge "Platinum Protection warranty" on these Ranger ED's which means they have an unconditional, unlimited and transferable protection and they will decide if your binocular needs to be repaired or replaced which is excellent and demonstrates their belief in this product. Strong Points: The general build quality looks to be good and for the most part they have used materials and components that are equal or superior to most in this price category. 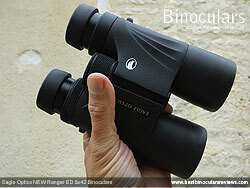 The body is nice and compact and lightweight for a 42mm binocular and they have a well balanced feel to them in the hands. With the obvious goal of bringing them down to a lower price bracket, Eagle Optics have had to make a few changes, but what is great to see is that they have not compromised on the quality of the optics, which are maintained to highest levels. A real highlight and a good example of this is the use of dielectric mirror coatings on the prisms, which is as good as it gets and something that is very rare at this price level. Their extremely close focus and long eye-relief is outstanding and the lockable diopter shows some excellent attention to some of the finer details. Weak points? Perhaps I was just unlucky with the connector ring on the objective lens cover breaking and whilst they work perfectly fine and fit well onto the end of the bin, they don't quite match the quality of the rest of the instrument. Some people who especially need or like a really wide view may be a little disappointed with these, but they are far from being described as narrow and for most of us the difference that you see between these and the majority of 8x42 bins is pretty small and is no issue at all. Whilst it is not really weak point, I would have preferred these to have a magnesium chassis like the previous version. However to bring the price down to this level, some changes had to be made and I guess this was one of them, but the really important thing to keep in mind is that Eagle Optics have not let the view quality drop by cutting back on the standard of the glass and their coatings. 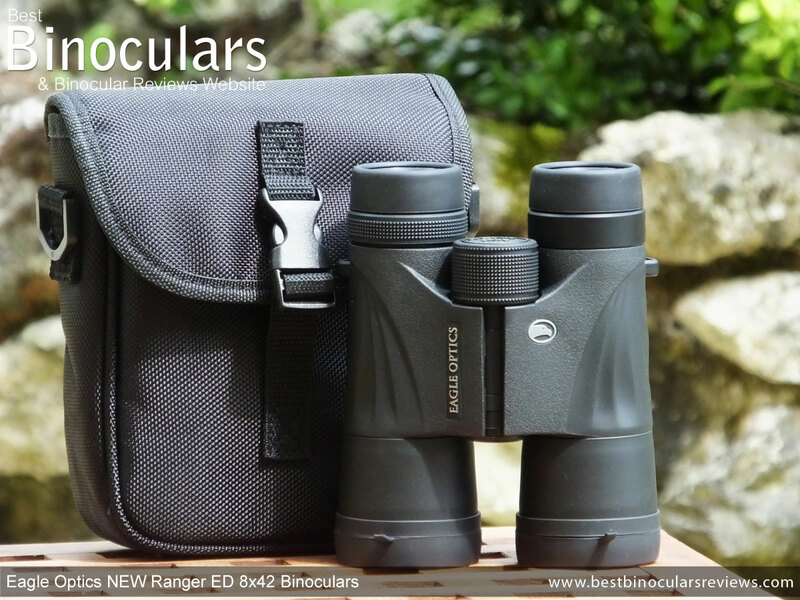 Overall - There is no doubt that the NEW Eagle Optics Ranger ED 8x42 binocular is quite a different beast to the previous version that I tested. Yes, they now use a more standard polycarbonate chassis instead of the magnesium open bridge one and there are a number of other changes as well. But what has not changed are the really important characteristics of using really high quality optics & coatings that all combine to present you with a superb view and now you get the added bonus of them costing a whole lot less, which is why I think this bin is a real winner within it's class. Ideal Uses: As with the majority of good 8x42 binoculars, their size, good light gathering capabilities, magnification and field of view all combine to make a great all round binocular that will perform well in most normal applications. This and their lack of any major weaknesses thus lends them to be an ideal general use bin as well as a solid choice for most types of birding, wildlife and hunting applications. 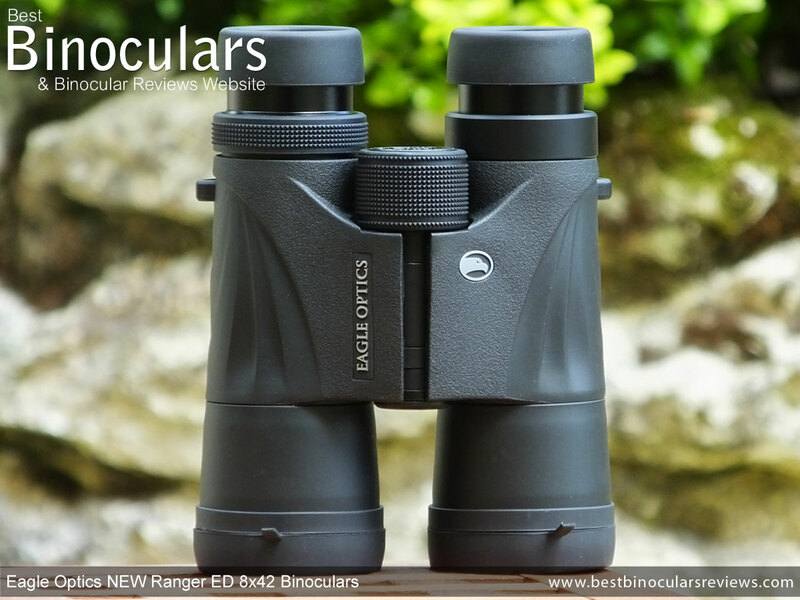 One of the main reasons I started Best Binocular Reviews was because I became very frustrated by the lack of good, honest advice and reviews about binos on the web. Whilst this was many years ago now, things really have not got that much better now and I still see that whilst there are quite a few "reviews" out there, most are little more than adverts written by those who probably have never used binoculars and definitely not the ones under review. I would like to assure you that this review is my completely honest opinion of the Eagle Optics New Ranger ED 8x42 binoculars that I wrote after comprehensively researching, testing, using and comparing them with others. The facts and figures are to my knowledge correct, however I do sometimes make mistakes, or incorrect details are suppled to me, if you see any, please feel free to contact me so that I can make the relevant changes.